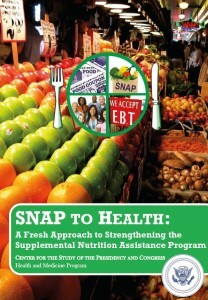 Highlighted innovative strategies for improving nutrition in SNAP. Discussed the importance of this program for children’s health. Described the dual public health challenges of food insecurity and obesity in the United States. Presented a roadmap with recommendations for strengthening SNAP now and in the years ahead to help alleviate food insecurity, improve nutrition, and reduce obesity among low-income individuals and families.